The Centennia Historical Atlas desktop app runs on Windows (10/8/etc.) and Apple MacOS. The app requires 20 megabytes of disk space. Centennia does not have any other significant system requirements, and it will run well on almost any computer manufactured in the past ten years. Three languages are included: English, German, and Greek. To change languages, open the app and hit "E" on your keyboard for English (EN), "D" for German (DE), or "L" for Greek (EL). Centennia Nations Edition is available for free. Download it below. Centenia Nations Edition covers the 150-year period from 1789 to 1939 and is available at no cost. To access the full time period, all ten centuries from 1000 AD to the present, you will need to purchase an access code. All data are included in this download. If you decide to purchase an access code in the future, you will not need to download again, and you will have immediate access to the full ten centuries in the Complete Edition of the Centennia Historical Atlas. The Windows download (fully compatible with Windows 10/8/7 etc.) is a standard Windows Setup program. 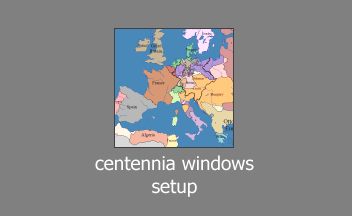 Download it and then double-click "Centennia Windows Setup" to install. The MacOS download is a disk image (dmg) file. Download it, then drag the Centennia app to your computer's desktop or Applications folder. Double-click to run. 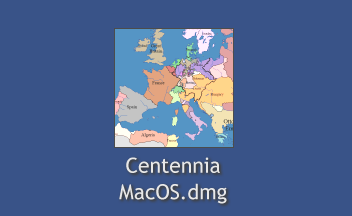 On first run, your Mac may inform you that Centennia is "not optimized" for your computer. This is a harmless "nag" message from Apple and should only appear once. 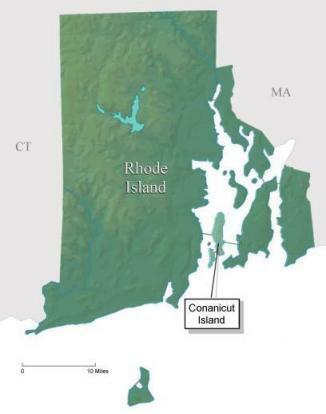 Have an older version of the Centennia Historical Atlas? If you purchased your access code within the past ten years (January 2009 or more recently) then you can continue to use your current access code. If you purchased before that, you'll need an upgrade. Contact us for details.